Amidst the discussion arising from my previous post on Battlefront Miniatures’ newly released British Paratroopers someone posting on The Miniatures Page pointed out that the para figures from Peter Pig, my personal favourites, have similarly proportioned heads to the Battlefront figures that I’ve described as grotesquely malformed. Well I didn’t really believe him, but in the interests of fairness I decided to have a look. Well it’s almost true. As you can see below the Piggies are about four and a half heads high, slightly less distorted than the Battlefront ones, which are about four heads high, but still well outside the normal human range of six to eight. So how come the Piggies manage to look vaguely human while the Battlefront ones look like apes? Well the small difference in head height seems to make a significant difference to the overall look and the Battlefront figures are considerably chunkier than the Piggies. The weapons and detailing are also more exaggerated on the Battlefront figures while the Piggies have traces of a neck. Just look at the size of the equipment on the Battlefront figure below left. The chinstrap on his helmet is enormous, blocking out half his face, while he appears to have a fridge rather than a radio set. 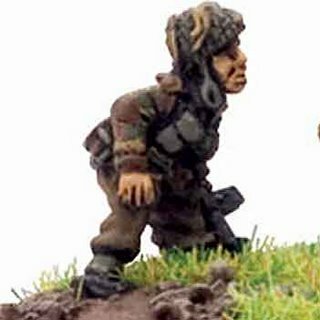 To my eyes the Piggy Paras look human while the Battlefront ones have gone over the top into the realms of the grotesque. But the differences between them are certainly not as great as I initially thought.